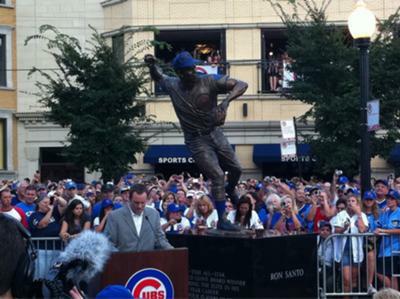 Take a look at the statue of Ron Santo which has recently been placed outside of Wrigley Field. Is the throwing motion depicted accurate? The footwork seems wrong to me. What a great tribute to one the best Cubs of all time! I have not seen the statue yet but I heard the Cubs put one up. I know the Willie Mays statue in San Francisco is impressive too. I would say you could be right and wrong in your observation of the correct throwing motion. You are certainly right that the footwork is incorrect if Santo is throwing the ball after fielding a routine groundball. The throwing motion in baseball requires throwing mechanics with the infielder’s feet underneath them. Using the proper baseball throwing mechanics a fielder would not be throwing off-balanced fielding a routine grounder. Santo appears to me to be throwing off-balance—so you are right on if you assume that he is fielding a normal infield grounder and using proper throwing technique to make a hard throw to firstbase. His footwork is wrong to me too. Although, I think you are wrong only because Santos footwork indicates he is fielding a ‘slow-roller’ a swinging bunt or a high chopper. On a ball hit slowly in the infield causing the infielder to run in and charge the ball forcing the player to throw the ball on the run. To me Santo looks like he just fielded the slow-roller and has transferred the ball from his glove to the throwing hand. The entire time running quickly before, during and after the throw has been released. When a third baseman has to charge a bunt he would catch the ball with two hands on the inside of the left foot. Without slowing, the ball transfers to the throwing hand and within one more step the throw is off toward firstbase. The baseball throwing mechanics would be: while on a good fast controlled run the fielder catches the ball on the left foot and throws the ball on the right. This is one of the fastest baseball throw. It takes lots of skill and practice to make this difficult play look so easy and Santo was among the best to play thirdbase. Good infielders have to be able to use different ways to throw a baseball from different arm angles and footwork. I would bet that who ever researched the Santo pose in the statue knew that he was throwing the ball after fielding a bunt or slow roller—therefore the footwork would be correct.